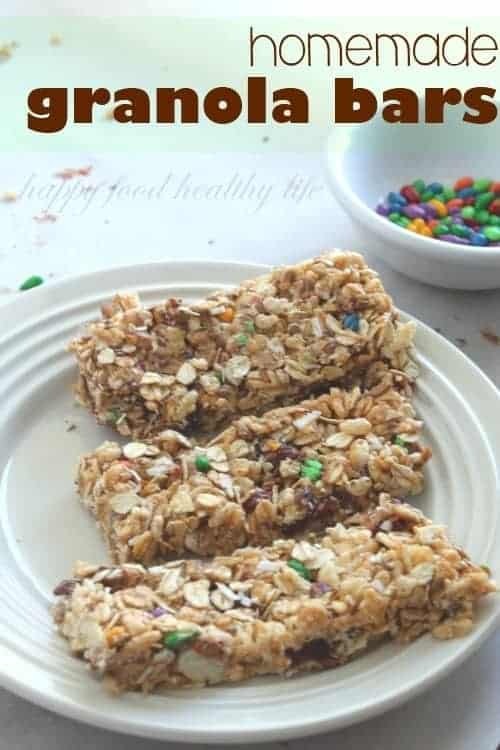 One of the easiest snacks for us to grab after school before heading off to my kiddo’s martial arts practice is a granola bar. It’s also a great one for my honey to grab in the morning on her way to work. The only problem with boxed granola bars? All the extras they add without you even thinking about it. You hear granola bar and you think healthy, right? Not always the case – actually not usually the case. So I decided to take matters into my own hands and make them in my own kitchen. This way, I knew exactly what was going into our healthy snacks and keep all the bad stuff out. I asked Xander what he would like in our homemade granola bars, and he immediately chose chocolate chips. Well, that takes the health factor right out now doesn’t it? I suggested sunflower seeds. He didn’t love that idea. We compromised on chocolate covered sunflower seeds, which was such a great addition. I also thought this recipe would be a fun one to make with Xander since it’s just so easy, and because he is going to be the one to be eating these snacks more than anyone else in the house. It’s so fun to get the kids involved in making the foods they eat. This gives them a sense of accomplishment, plus they’re more apt to eat what they made. The thing is though, I had no idea how much Xander was snacking while making our video. He didn’t really care about helping as much as he cared about eating coconut, sunflower seeds, and craisins. He was seriously busy nomming pretty much the whole way through. It’s pretty humorous. He’s the kid that will sneak into the kitchen while I’m chopping veggies, measuring chocolate chips, and slicing cheese. I’ll turn my back, and as I turn around, I see a flash of 6-year-old running out of the kitchen giggling. Seriously, hard to get upset at a kid who’s just so darn cute, like mine is. Cut parchment paper to fit a 9×13 or 8″ pan. This will make it easier to remove the granola bars. Combine oats, cereal, coconut, flaxseed, craisins, peanuts, and sunflower seeds in a bowl and mix together. In a small saucepan, over medium heat, mix honey, brown sugar and salt. Stir until it comes to a slight boil. Remove from heat, stir in the peanut butter and vanilla until incorporated. Pour the warm mixture over the dry ingredients and mix until well combined. Add mixture to the prepared pan and with a piece of parchment paper; press down to even out the surface. Place in a safe spot and cover. Let sit for a few hours to let everything set. Remove from the pan and cut into bars. Enjoy! I hope you try out this healthy snack and stop buying boxed snacks thinking they’re good for you and your family. Even if you don’t try this one, maybe you could try to recreate one of your “boxed” recipes into a healthy alternative that will better serve your family with nutrients. I am going to try really hard to start using more REAL ingredients this year and really start bringing in the ingredients that will fuel my family in a healthy manner. What are some of your favorite healthy after-school snacks? Yay! I’ve really wanted a good granola bar recipe. Definitely gonna try them out and really glad it doesn’t require an oven! Where did you get the sunflower seeds? Yes this is definitely a good one. Also good crumbled into yogurt! I got them at winco in the bulk section but I bet whole foods? Or maybe even target. I’m not sure but I’ll keep my eye out for them. If I made a large batch of these, how long do you think they could be stored for? Hi! Thank you for stopping by. You are definitely going to want to make a large batch because they’re so so yummy! They should last about 2-3 weeks if stored in an air-tight container. Let me know if you try them and what you think! What a cute video, Holly! The 6-year-old antics I could totally identify with, because I have a 6-year-old, and they're hilarious! Loved his adding to the video, "Great for SCHOOL….and for the weekend!" Very adorable! And I will have to make those. My kids would love them! Isn't 6 such a funny age? I just laugh watching these videos because he's so goofy right now. I'm definitely going to be glad in the future that this time has been documented. I sure hope you try these bars out! Let me know if you do! These are so fun–I love the pop of color from the chocolate-covered sunflower seeds! Pinning this one from our Pinterest party on Online Blogcon today since I don't drink alcohol. Can't wait to try these! 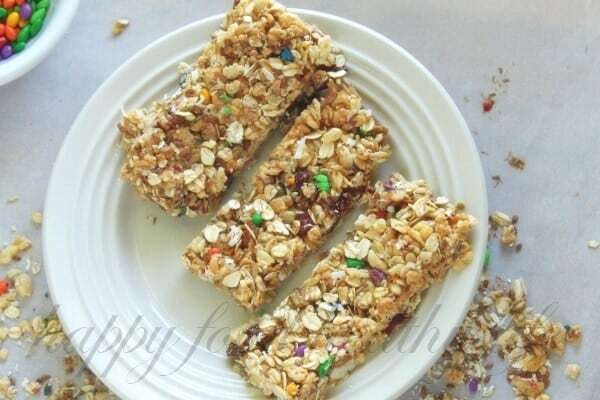 These are the most amazing granola bars. My question though is how to keep them stuck together. They are ok for about 2 min out of the fridge, then fall apart. Flavor is fabulous but I cannot have them at room temp. I hear ya! Who has time to cook these days? 🙂 I hope you do try them out though!